I am currently rebuilding my 2001C from the ground up. I have done alot of work on the electrial in the past getting rid of blinkers and removing fender tail light and things like that. Though that experience I have learned one thing....HARLEY WIRING IS A CLUSTER !!!!! My question is does anyone know where I can find a bare bones electrical schematic or someone who can create one for a 2001C. By bare bones I mean just what I need to power headlight, battery, horn, starter things like that. No harnesess, blinkers and misc. wiring that Harley seems to put on their bikes. ANY help would be good help. Thanks in advance guys! 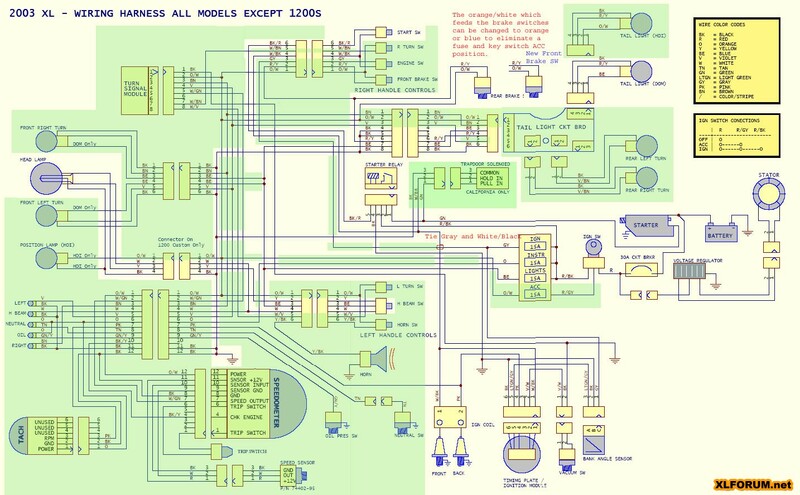 I doubt you'll find a bare bones wiring schematic. My recommendation would be to get your hands on a repair manual (H-D, Clymer, etc. ), scan the diagram into your computer, and just use something like Paint to edit out the wires you don't want. Then print it, and there you are. That way you can ensure the accuracy of the diagram, you have the exact components you want, and nothing else (plus, if you keep the original scan, you can always go back and redo it if you decide you want to add other electrical components later). I know it's probably not the answer you were looking for, but I'd be a little skeptical of taking any homemade wiring diagrams from strangers as gospel, and (I'm sure for legal reasons) no corporately published manual is going to eliminate things like turn signals from their diagrams. I need more Plan B's in my life. Plan A rarely works as advertised. Thanks Casper, Thats not a bad idea. When it comes to mechanical aspects of my bike im on it but electrical or even house electrical for that matter I'm like a deer caught in the headlights! Sportster/Buell Model #2: Flyrite Rigid completed? I have an '03 HD manual. If you have a fax# I can make diagram copies and fax them. PM me if you have a fax#. that mount to the end of the solenoid (J&P has then for $40). Gary, You rock man. Actually I was wanting to go with a push button or toggle switch. This is what I was looking for. Thanks for taking the time to scan that schematic. Nice to know there are brothers out there willing to help out! there willing to help out!